Research the full name of the charity, and identify the city and state where the organization's principal office is located. This will ensure that the charity is listed correctly in your financial documents. Notify the charity that you are listing it as a beneficiary. Many charities provide specific instructions on how to do this, and the organization may list a specific contact person on its website. List the charity as a beneficiary in your will. If you are leaving personal property or money to the charity, specify the items or amount of money you are leaving. If you are bequeathing a life insurance policy or IRA account to the charity, you'll need to modify your account documents with the custodial institution that holds the account. However, also listing the bequest in your will can help ensure that the charity receives the gift. Notify the executor of your will that you've named the charity a beneficiary, and let him know where a copy of your will can be found upon your death. Contact the institution that issued an insurance policy or other financial asset you wish to leave to a charity. The institution will provide you with paperwork to add a beneficiary. Fill out the paperwork in full and attach any documentation required by the institution. Return the paperwork and request a copy of the paperwork once it has been accepted and filed. Check the paperwork to verify its accuracy. Wills, Trusts and Estates, Eighth Edition; Jesse Dukeminier et al. 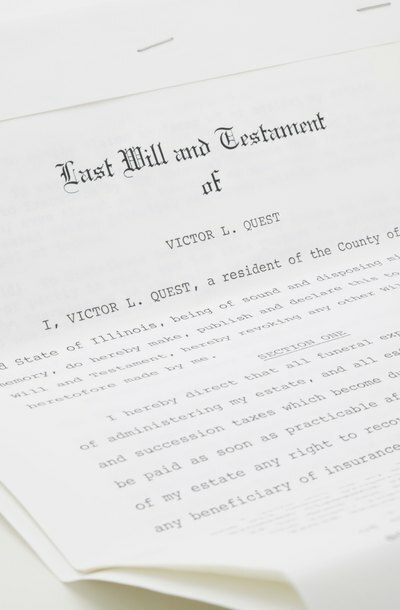 Grand Valley State University: What Is a Charitable Bequest? A trust is a legal document created for the benefit of one or more beneficiaries. If you are the acting trustee of a trust, you have several duties to fulfill. For example, you must manage the trust as stipulated by the grantor, and you must ensure the trust fulfills its intended purpose. In the course of your role as trustee, several situations may arise in which it may be necessary for you to address a beneficiary in a letter.